Tamiya 1/16 German Machine Gunner Model Discounts Apply ! TAM36306 - Tamiya 1/16 German Machine Gunner Model. 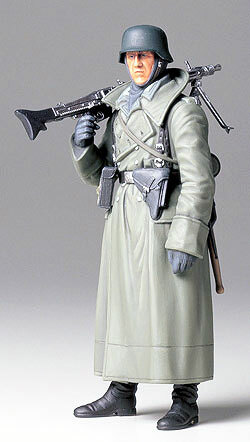 Finely sculpted figure wears late-WWII greatcoat and totes powerful MG42 Machine Gun. Realistic greatcoat is assembled from three parts and topped of with a separately molded collar piece. MG42 Machine Gun equipped with cover and ammunition drum. Gun composed from 9 realistically recreated parts including two types of support stand. Tamiya #36306.